Rep. Jimmy Gomez proudly represents California’s 34th Congressional District, a diverse and culturally rich region that includes communities across Central, East, Northeast, and Downtown Los Angeles. 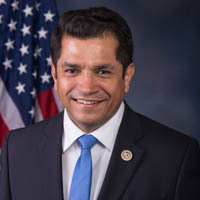 He currently serves on the House Oversight and Government Reform Committee and the House Natural Resources Committee, and is a member of the Congressional Hispanic Caucus, Congressional Asian Pacific American Caucus, Congressional Progressive Caucus, and Congressional LGBT Equality Caucus. Prior to his time in Congress, Rep. Gomez served nearly five years in the California State Assembly, where he also served as Chair of the Assembly Appropriations Committee. He attended Riverside Community College, received a B.A. in Political Science from UCLA, and a M.A. in Public Policy from Harvard University’s John F. Kennedy School of Government. He lives in Eagle Rock with his wife, Mary Hodge, and dog, Austin.